What an awful old man, poor woman. Stereotypes seldom serve us well for long. Old people are kind and loving, young people are selfish and disengaged. And then something happens to remind us that we are each unique and stand on our own merit, not someone else’s narrow view and assumptions. 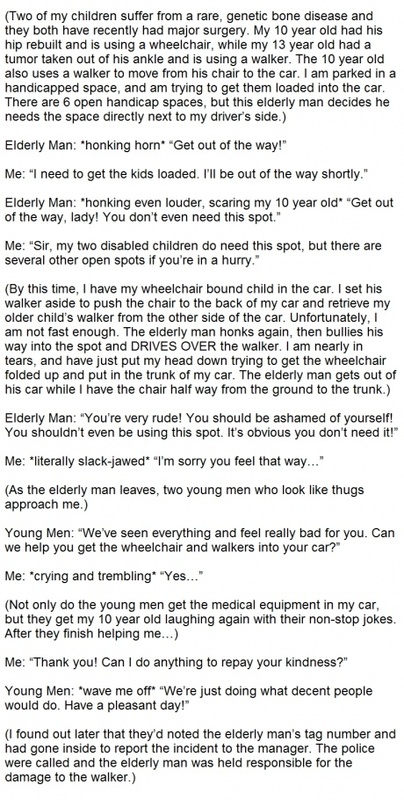 I’m sorry you had to experience the actions of that obviously angry and bitter old man. Your story reminds me of an experience several years ago when I was taking my mother-in-law, a double amputee, grocery shopping. Of course we parked in the handicapped parking using her valid hangtag. I needed that bit of extra room to get her in and out of the car from her wheelchair and then get the wheelchair loaded in the car! A woman drove by and saw me loading the wheelchair in the car and started yelling nasty things out her car window along with obvious finger movements. People just don’t think, they assume that those spots are being used unnecessarily, So glad the man was reported by those boys and that he was held responsible for the walker damage. Hello Elaine 🙂 and thank you for sharing your similar experience with us.